Home » Climate Change » Wildwood and Maplewood Lead the Pack on GHG Emissions – But Should They Celebrate? Wildwood and Maplewood Lead the Pack on GHG Emissions – But Should They Celebrate? Twelve Missouri communities completed greenhouse gas emission inventories between 1990 and 2010. If this were a race, it would be a race to the bottom, and Wildwood and Maplewood would lead the pack, with per capita GHG emissions sharply lower than the others. For nine of the communities, per capita GHG emissions were between 20 and 30 MTCO2e. But Maplewood’s were 12.9 MTCO2e, and Wildwood’s were even lower, at 7.57 MTCO2e. Creve Coeur’s emissions, on the other hand, were 47.1 MTCO2e per person, significantly higher. But it’s not clear to what extent the emission levels are a result of more efficient energy practices, or simply a reflection of other differences between the communities. In the graph at right, each column stands for a different community. Within each column, the colors stand for sectors of the community. In all jurisdictions, buildings account for the largest portion of emissions. The built environment is best represented by combining the residential (blue) and commercial (red) sectors. Across the 12 communities, it accounted for between 43% and 87% of per capita emissions. These findings were the result of greenhouse gas inventories conducted in the 12 jurisdictions between 1990 and 2010. I have previously posted on each one. To find the post for a specific community, look on the List of Posts. For a description of how I constructed this comparison, see below. Human nature begs for comparison, and some sort of context is required in order to understand each communities emission levels. But there are problems in comparing emissions between communities. Places are very different, and emission levels may be a result of other differences between the communities, as much or more as a result of energy efficiency practices. In addition, the inventories have studied baseline years ranging from 1990 to 2010. Emissions depend mostly on energy consumption, and energy consumption varies from year-to-year with economic conditions, with changes in energy efficiency, and with the weather. This is the first in a series of posts summarizing the results of the 12 GHG inventories. More to follow. For links to the GHG inventories from the 12 jurisdictions, see my previous posts on each one. Here’s a link to a list of previous posts. Missouri population is from Part 1. Population of the United States and Each State: 1790-1990, http://www.census.gov/population/www/censusdata/Population_Part1.xls. County populations are from Table 1. Annual Estimates of the Resident Population for Counties of Missouri: April 1, 2000 to July 1, 2009, http://www.census.gov/popest/data/counties/totals/2009/tables/CO-EST2009-01-01.xls. Municipal populations are from Table 4. Annual Estimates of the Resident Population for Incorporated Places in Missouri: April 1, 2000 to July 1, 2009, https://www.census.gov/popest/data/cities/totals/2009/SUB-EST2009-4.html. Geographic areas are from the Wikipedia article for each location. To make this comparison, it was first necessary to adjust the results for the State of Missouri and Columbia from short tons to metric tons. It makes no sense to directly compare the total emissions of states, counties, and municipalities: the differences in scale would make the comparisons ridiculous. However, there are several factors that express the scale of a jurisdiction. Three are land area, population, and economic activity. Comparing GHG emissions on a per square mile basis, on a per capita basis, or on a per unit of economic activity basis may be more appropriate, canceling out differences in scale. The land areas of a state, county, or municipality is easy to find. The population of a given jurisdiction in a given year is also relatively easy to find. GHG emissions per unit of economic activity may be the most relevant of all, however it is not so easy to find. What would be wanted would be the total economic product for the jurisdiction, something equivalent to what Gross Domestic Product represents for the entire USA. 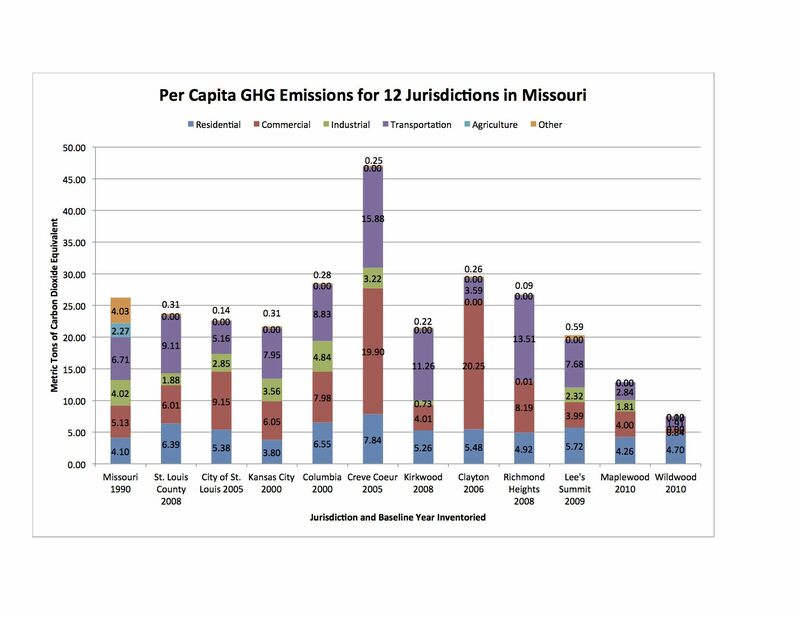 Domestic product for the 50 states is available, and I have used that metric to compare Missouri to other states (Comparing GHG Emissions Across States), but I have not been able to find it for counties or municipalities. In reporting per capita emissions, some of the GHG inventories appear to have used population estimates that vary from those in tables published by the Census Bureau. Though I accepted the results from each inventory when I reported on it, here I thought it best to minimize this source of change between inventories, using population estimates from the appropriate Census Bureau table as described below. As a result, the per capita emission amounts here may vary from those reported in the posts on the individual GHG inventories. By mogreenstats in Climate Change on 2013/04/18 .